Description: The south of Kyrgyzstan is a wonderful region, beautiful, strange, and quite different from other regions of the country. A warm climate, wonderful nature, white mountain peaks, bright colors of oriental bazaars, a three thousand year history, and magnificent hospitable people; this is not a full list of the characteristics of the south of Kyrgyzstan. Osh is the southern capital of Kyrgyzstan and we suggest you begin the acquaintance with our region with this city. Osh is situated in the southeastern part of Fergana valley, at the northern base of the Kichi-Alay mountain range at an altitude of 1,000 meters above sea level. Three days' stay in the city will give visitors the chance to experience the history of the region, from the late bronze age (late 2nd - early 1st centuries B.C.) to the present day. They will take excursions to mount Takht-i-Suleiman, which is situated in the center of the city, where they will visit an ancient temple of fire worshippers and learn about their lifestyle and rituals, and visit an original observatory from the late bronze age. We will also have an excursion to the old capital of the Karakhanids, Uzgen, and explore the architectural monuments of that period (11th - 12th c). The out of town part of our tour lies in the mountainous regions, alpine meadows, and glacial areas of the Kichi-Alay and Alay mountain ranges, which are the northern foot of the Great Pamir Mountain system. The tour plans call for visits to the two most beautiful spurs of the Kichi-Alay and Alay mountain ranges: Kozho-Kelen (Great Khodzha) and Abshyrsay (Milky River). 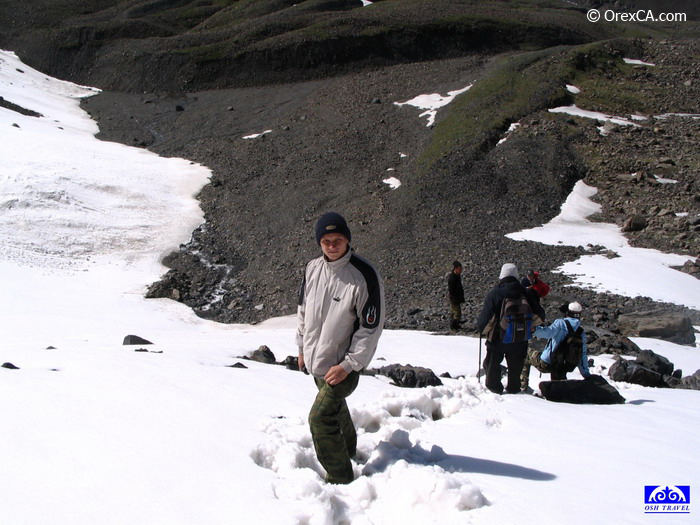 During their stay in the region, our travelers will visit three climatic zones: semi-desert, temperate and permafrost. In the mountains, guests will stay in felt tents (yurts) which are the traditional dwelling of the Kyrgyz people. A yurt camp is situated at an altitude of 2,500 meters above sea level in the Kaiyndy (Birch glade). During their stay in Kozho-Kelen, visitors will et to know the unique nature of the region, trek to Jiptyk Pass (4,185m) from which they will be able to see a wonderful panorama of Lenin Peak (7,134m), ride horses to the Blue grotto, which has a small lake inside. Droplets falling from the niche of the grotto make a peculiar mysterious type of music. Afterwards our guests will ascend the unusual gorge of Kozho-Kelen, striking with its variety of colors, with a visit to Kozho-Kelen waterfall en-route. They will travel by vehicle to Abshir-Ata, a unique place famous for a waterfall falling from a cave, being the mouth of an underground river. In addition, guests throughout the tour will learn the traditions and customs of the Kyrgyz people, visit summer Alpine pastures (jailoo), take part in the preparation of traditional Kyrgyz dishes, and make Kyrgyz goods from felt. They will learn how to construct a yurt and get acquainted with Kyrgyz cuisine. All trips are accompanied by interesting travel information presented by skilled guides. After lunch, excursion around the city with visits to: museum of local lore and history, "Jibek Joly"; the oldest mosque in the city. Dinner in "Al Faiz" cafe. Departure to Kozho-Kelen village (Great Khodzha) (110km). Excursion to Blue Grotto and Kozho-Kelen waterfall. After lunch - travel to jailoo (summer nomadic camp of Kyrgyz people) (2,700m). Acquaintance with nomadic way of life of the Kyrgyz people. Demonstration of felt and milk processing with guest participation. Return to village. Lunch in village guesthouse. After lunch - return to Osh. 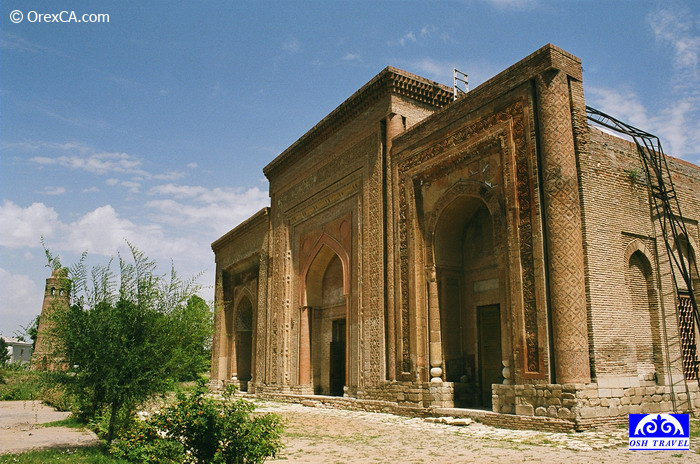 Trip to ancient capital of Karakhanids, Uzgen (68km). Walking tour of Uzgen Bazaar. Lunch in Osh in local restaurant. After lunch, trip to chaykhana. Preparation of festive plov on an open fire. Trip to Abshirsay waterfall (110km). On the way, visit to Dul-Dul-At, which is famous for its petroglyphs of Davan fast horses, Big Barium cave (60m). On arrival at Abshirsay - excursion to Abshirsay natural boundary and Abshir-Ata waterfall (35m high). Picnic lunch at Abshirsay natural boundary (1,700m). Visit to private museum of semi-precious stones and minerals.